Michelle Jalaba is a competitor. Growing up in suburban Detroit, the middle child among four other siblings — all of whom went on to become collegiate athletes — she had little choice. Or it’s genetic. Or both. Jalaba started training as a gymnast when she was six years old. By the time she was 13, she had Olympic aspirations and was training several hours every day. As a freshman in high school, she won the state title in the beam. When college rolled around, she competed in the Big 10 as a member of Michigan State’s gymnastics team. Unfortunately, years of training took a toll on Jalaba’s body. She was sidelined by injuries in college and eventually underwent 13 surgeries to repair everything from her knee and shoulder to her ankle. Jalaba focused her energy elsewhere. She worked in real estate and insurance, sports training, and promotions, and eventually decided to attend medical school. She applied and was accepted, but a series of life circumstances once again conspired to derail her. Amidst the confusion of finding herself in life circumstances considerably different from what she had anticipated, Jalaba looked for something to grasp onto. And that turned out to be a fishing rod. She had fished as a young girl, and Jalaba now reached back to those familiar experiences to ground her. “I started fishing with intention,” she says. That was six years ago. Then she started fishing in all of her free time. 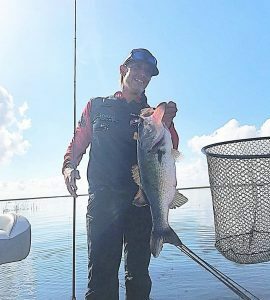 Jalaba would fish on nearby Kent Lake and often make the trip to Lake St. Clair, which she thinks of as her home fishing turf. Lake St. Clair is a renowned smallmouth bass fishery. Realizing this, Jalaba’s intensity and laser focus kicked in. “I became fixated on figuring them out,” she said. Not surprisingly, she caught on pretty quickly. Local reelers took notice. And soon, Jalaba was invited to participate in her first tournament. 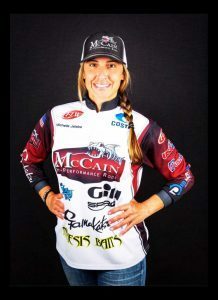 Now in her fourth tournament season, she is a co-angler on the FLW Tour and works with the U.S. Angling Confederation. This month, Jalaba participated in the first-ever Pan American Championship bass tournament, in which Team USA Bass captured gold. 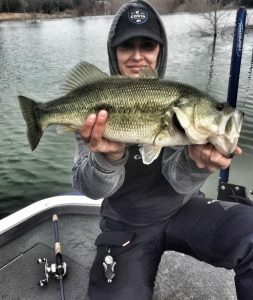 A self-starter, Jalaba has gotten to where she is all on her own — with some help from sponsors like McCain High Performance Fishing Rods, The O’Wacky Tool, Advasure Insurance, ProAngler Hub and Nemesis Baits (the Bullet Craw in black and blue is her go-to). As much as the competition fuels her, it’s ultimately the bass themselves that drive her to get out on the water. And for Jalaba, there’s a therapeutic component to fishing that she believes anyone can appreciate. Jalaba doesn’t see herself leaving the sport anytime soon, either. Follow Michelle Jalaba’s fishing adventures on YouTube.